The CI-200 provides an easy-to-use connection from any Windows or Linux PC, and the AM Communications Bus. It utilizes USB and TIA/RS-485 electrical standards to implement a serial data connection from any host PC to any collection of DC-series Controller/Driver units. I-200 Drivers are available, below. The CI-200 provides a communications interface between any set of AccelMotion DC-Series Step Motor Controller/Driver Modules and a standard PC with USB 2.0 interface. It utilizes a simple Serial Port model and Virtual Port Driver to allow easy serial host access to DC-Series module CLI (Command Line Interface) via USB, at 115kbaud. 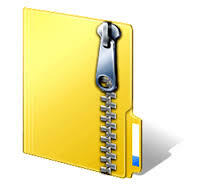 It utilizes the data connection of any USB-type-A socket on any PC, under the USB 2.0 standard. The CI-200 can be easily utilized by Windows and Linux scripting programs (such as LabView, Python, etc.) and by terminal programs (such as Console, TeraTerm, HyperTerminal, etc.). AccelMotion recommends the use of its no-cost AccelCom terminal, which automatically supports the CI-200 via Virtual COM port and also provides helpful programming and parameter-setting features. 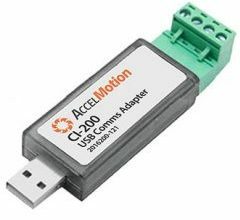 The AccelMotion (AM) Communications Bus is based heavily on TIA-485 (RS-485) electrical standards, carrying serial data at 115,200 baud, and specified as a sheilded differential twisted-pair connection, terminated at each end. Supports WindowsXP, WindowsVista, Windows7, Windows8 and Windows10.